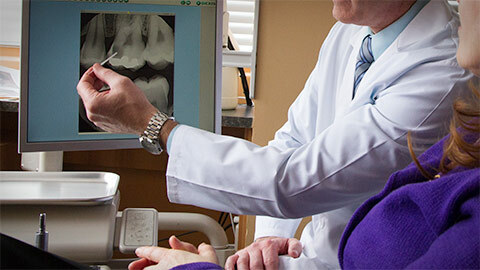 Endodontics is the field of dentistry that deals with the “inside” of your teeth. It focuses on the protection, treatment and preservation of the pulp, the bundle of nerves and blood vessels inside each tooth. Root canal therapy is a common procedure used to save a broken tooth from being lost completely. It is used when the pulp is placed at risk of infection or damage. This usually happens if the tooth is broken or cracked or when decay penetrates into the soft tissue of the tooth. In the root canal procedure the pulp is surgically removed through a small hole drilled in the tooth, then the tooth is sealed to prevent further damage. It can then be restored with a filling, crown or other restoration. One of the symptoms of a damaged pulp is a sharp burning pain in the tooth. If you are experiencing this pain, or if you suspect a tooth might be damaged, contact our office to book an examination.